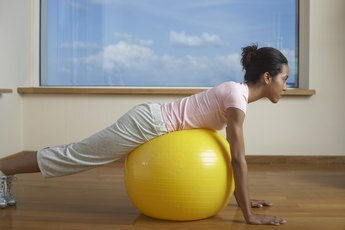 A stability ball provides support for your back while you work your midriff. Whether you've just had a baby or continually store excess fat around your middle, those pesky midriff muscles can be difficult to target. The abdominal muscles are actually made up of four sets of muscles -- the rectus abdominis is the outermost layer, extending from beneath the ribs down to the pubis. The internal and external obliques are the muscles running along the sides of your midriff. Finally, the transversus abdominis is the innermost layer of abdominal muscle, which works to hold internal organs in place. A routine that focuses on all of the ab muscles will produce a strong midriff. 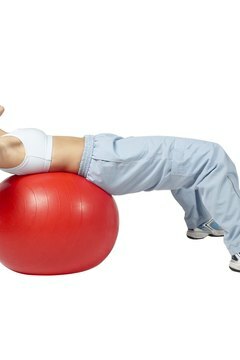 Stability balls allow you to do a variety of abdominal exercises while protecting your back. Stability balls comes in different sizes, so make sure to choose the right size based on your height. Don't forget to breathe deeply as you perform each exercise. 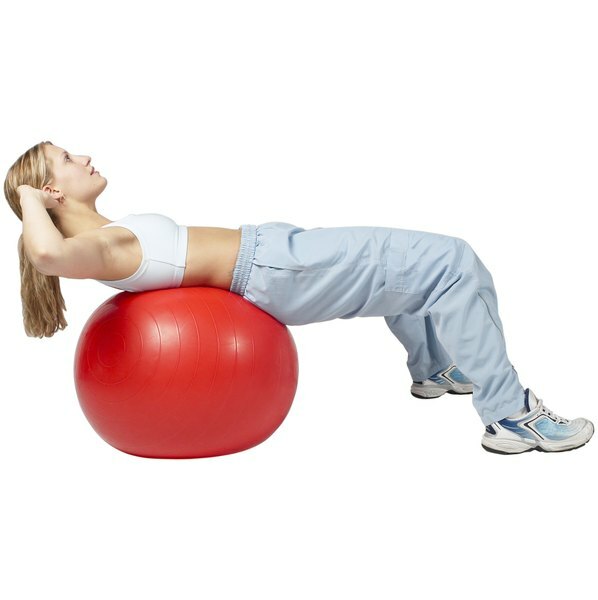 Target your abdominal muscles with crunches on the ball, the plank, the abdominal ball raise or a reverse crunch. Aim for about 10 to 15 repetitions per exercise. Pilates is a series of strength-building movements named after its founder, Joseph Pilates. 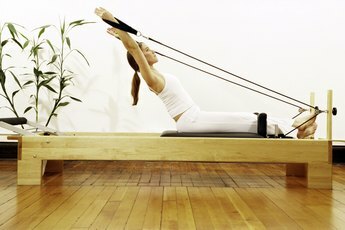 The goal of Pilates is to stretch and strengthen the muscles while improving flexibility, balance and muscle control. All Pilates exercises stem from the body's core, resulting in strong and lean midriff muscles. Pilates workouts require participants to pull the abdomen toward the spine during each exercise, engaging the innermost layer of abdominal muscles. 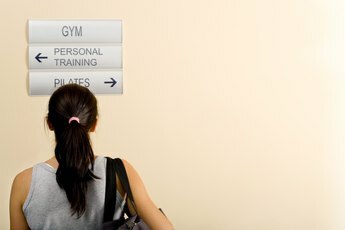 Although some Pilates classes require the use of specialized equipment, many routines can also be done using only an exercise mat. Try the Hundred, the Crisscross or the Side Bend to feel the burn that will produce fantastic results. You might think the classic abdominal crunch is a little too vanilla with all the other glamorous options in ab toning available. However, crunches are effective and require no equipment beyond an exercise mat. Begin on your back with bent knees, planting your feet firmly on the floor about hip-width apart. Support your head with your hands, keeping your elbows back. Do not pull on your neck. Avoid neck and back soreness or injury by pulling your belly button in as you lift only the shoulders and upper torso off the mat, keeping your hips and tailbone firmly planted on the mat. Target the obliques by taking the crunch motion from side-to-side by aiming the elbow toward the opposite knee. Exhale as you lift and inhale as you release the crunch back down to the mat. Yoga isn't typically honored for its ability to tone the abs, but perhaps it should be. Many yoga postures strengthen the core muscles by encouraging spine alignment and deep abdominal breathing which help engage the innermost layer of ab muscles. Yoga postures will keep ab muscles long and lean, rather than big and bulky. Common poses to try include plank pose, bridge pose, boat pose or upward bow pose. 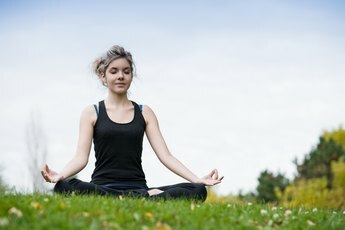 Focus on holding each pose for three or more breaths, inhaling through the nose and exhaling through the mouth.